Photos of the Railway Touring Co's 'Great Britain' round Britain land cruise. Most taken around Carnforth so they concentrate on light engine and stock positioning moves. The first GB ran in 2007, then it became annual from GB2 (2009). No photos of GB7 (2014) as I was away. 6233 Duchess of Sutherland, 5Z32, Hest Bank, 6 April 2007 - 1758. 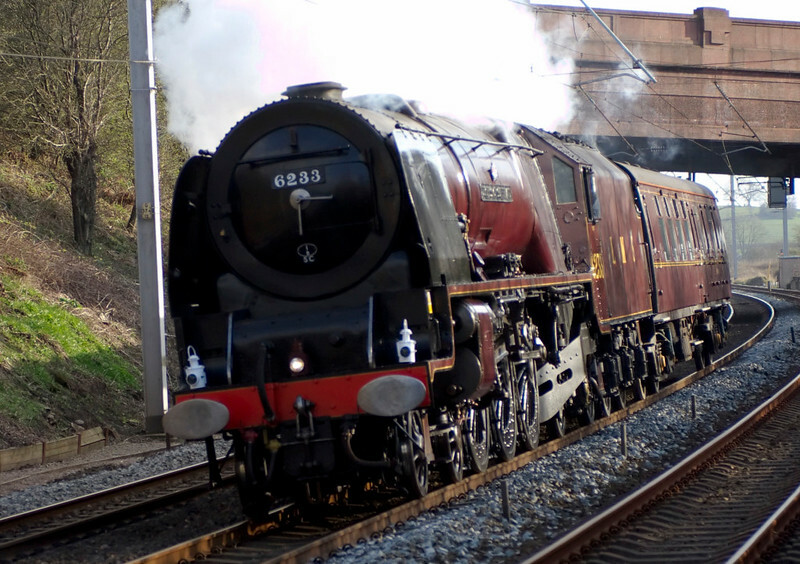 Good Friday, and 6233 leans to the Hest Bank curve on a Butterley - Carnforth positioning move prior to working the Railway Touring Co's round Britain 'Great Britain' tour from Preston to Glasgow on 9 April.